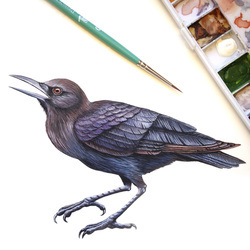 Jennifer Bates is a natural science illustrator and fine artist based in Seattle, WA. She spent her early years getting covered in graphite, paint, and clay. It wasn't until college that she became enamored with the natural world as well. Hands stained by art supplies quickly became hands crusted in dirt and hardened by exploration. Combining her interests in fine art and zoological field biology, Jennifer has found her niche in the realm of scientific illustration. Her specialty lies in detailed representational works of natural subjects, with an affinity for all things bird related. Her goal as an artist is to reintroduce the beauty of the natural world to those who spend the majority of their lives in urban areas, and to inspire them to explore the living landscape just outside their windows. In 2015, Jennifer graduated from the Science Illustration certificate program at California State University, Monterey Bay, and completed an internship with the Museum of Vertebrate Zoology in Berkeley, CA.